Below is a list of supplements and their uses, common dosage recommendations, and brands that we use. I’ll be adding to it as I learn of new ones. These are all specific to biomed protocol for treating autism, but many of these are helpful for just about anyone. This information is just a guide and it’s information I have gathered from my DAN! 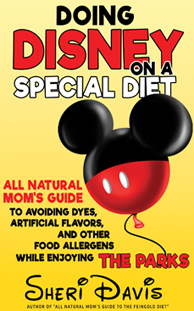 doctor, Internet research, and from other moms on the forum at www.gfcfdiet.com. The brands that I use aren’t necessarily the best ones out there. They are ones either my DAN! doctor recommended or moms on the forum. If I list brands like Solaray, NOW, or Country Life, those are just cheap ones I bought at the local health food store or Vitamin Shoppe because I haven’t had time to research the best ones. Those brands tend to not have any gluten, casein, etc. added to them. You’ll have to read labels to make sure the fillers used are safe for you. 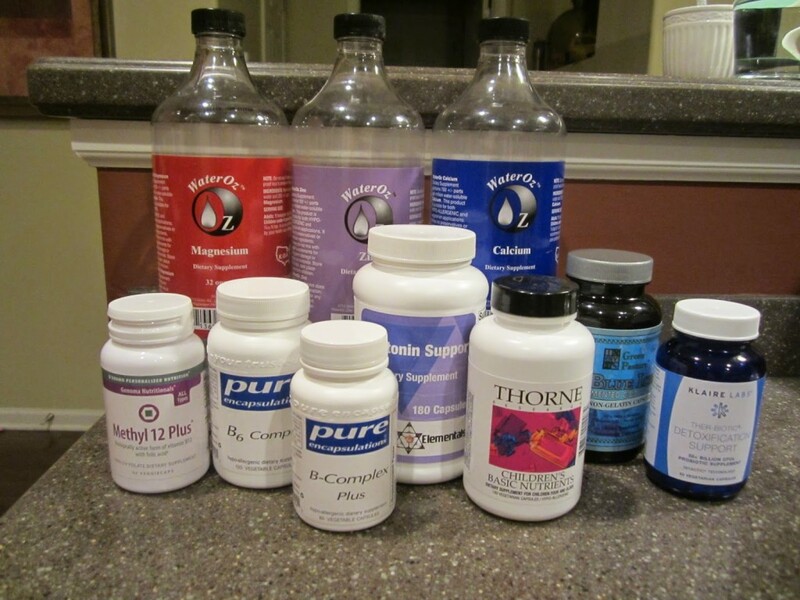 Most of the supplements listed below are supplements my DAN! doctor recommended after running tests on my daughter (blood, urine, stool, and hair) and are specific to her test results. However, upon reading and talking to other moms, many of our kids are taking the same supplements, some more, some less. My DAN! doctor seems to like the brand Pure Encapsulations. You can find this brand on many vitamin web sites. There are many. You just have to compare and look at shipping costs as well to find the cheapest. I haven’t one good one yet that has everything that I need. That’s why I’m listing them out here so I can compare better the next time I go to order. Start slow and gradually increase with most supplements. You can buy veggie caps from Whole Foods or a health food store. These are empty capsules that you can open and fill. Open up the capsules of your supplements and dump half of them into an empty veggie cap if you want to start with half. Start a new supplement about every 4 days. You want to watch for any negative side effects or improvements and be able to identify which supplement is causing it. Keep a diet diary of food and supplements. I have a good one but it’s in Excel so I don’t know how to post it here. If anyone wants it, just e-mail me. If you do notice issues, either lower your dose, or research it further and talk to your doctor about it. Brand we use: Methyl 12 Plus by Right 4 Your Type. Contents: Contains 1,000 mcg B-12 and 400 mcg of folate (or folic acid). You want your B-12 in the form of methylcobalamin. Where We Order From: I order directly from their web site, www.4yourtype.com. It’s $15.95 for 60 caps. I paid $7.67 in shipping for 2 bottles. How To Take: We started with one a day in the morning with breakfast (although B-12 doesn’t need to be taken with food), then increased to 2 a day after a few months. B-12 is a very common supplement that many kids on the spectrum are on. Some kids take B-12 shots and have seen big improvements in speech and mood with it. The shots are better absorbed by the body than taking B-12 orally, but we’ll never do shots. I’m afraid of needles! The capsules seem to work fine for many people. There is also a B-12 nasal spray offered as well. I’ve read that www.mercola.com sells one. B-12 Compliments: B-12 works well in combination with DMG. Pros for B-12: The most common thing I’ve read other moms say about B-12 is it’s help with speech and mood/behavior. I’ve also read it is good to increase focus and concentration. B-12 helps regulate neurotransmitters (in the brain) and helps with methylation support. B-12 and B-6 are commonly helpful for ADHD kids. Cons for B-12: All B vitamins tend to increase yeast (with the exception of Biotin which actually helps fight yeast), so you’ll want to have some kind of “yeast protocol” in place (see below). You might wonder, why would I want to give a vitamin that increases yeast? Because many of the B vitamins are needed in order to address some of the other issues kids have, and many of our kids are deficient in B-12. Some people take a B-12 nasal spray or B-12 subcutaneous injections which will not increase yeast. These forms are supposed to be better absorbed by the body. The shots are supposed to be MUCH better than the oral form, but we haven’t gone there yet. I’m afraid of needles! (even though they are really small ones). Brand We Use: The Original Gluconic DMG 125 by DaVinci Laboratories. Contents: We get the 125 mg, 90 tab packages. If you look up DMG, you will find many different DMG’s to choose from. This is the one my DAN dr. recommended and it has worked well for us. Where to Order From: I last ordered from www.naturasmart.com and paid $20.66 per box. The last time I ordered, I had found it for $17 but I couldn’t remember where I ordered from and this place offered free shipping over $50, so it probably ended up costing the same. This place took a long time for shipping though – almost 2 weeks. My DAN dr. charges $27 and I’ve actually seen it online for $47! I don’t know why. You can also order Pure Encapsulation brand vitamins from this web site. How To Take: Take one tablet in the morning for 2 weeks (to allow the body to adjust), then increase to one in the morning and one at dinner time. These are small white tablets that dissolve in the mouth. I’ve tasted them and I think they taste like dirt, but my kids like to take them and have never complained. DMG Compliments: DMG works well in combination with B-12. Pros for DMG: I really like this one. It has helped with my daughter’s mood a lot. My DAN dr. has it listed as a neurotransmitter support. I’ve noticed if my daughter is starting to have a meltdown or has just had one, and I give her one of these, her mood improves greatly quickly. I don’t use it for that, but sometimes it just happens to be about the time to take it anyway. The first week we started this, my daughter’s speech improved greatly as well. She was speaking much clearer and her speech came easier and she was thinking more clearly. I’ve found that to be true of many supplements – when you first start taking them, you see a profound improvement and then it tapers off. That’s common. Not in a bad way, but if you if you charted it and you started at 10, you’d go up to 75, then plateau to around 50 after their bodies adjust. I think it’s sometimes that the body needed that supplement so much that you see such a drastic improvement, and then once it has gotten that supplement, it starts to normalize. When my 22 month old son started taking this supplement, his speech skyrocketed as well! It was quite funny to listen to him start to talk in complete sentences. He still has very good speech. Interestingly, many of the supplements recommended by our DAN for our daughter are the same ones recommended for my other kids, even though they don’t have very many issues. I have heard similar stories from other moms. One said her 15 month old daughter who had no speech suddenly said “I love you Mama” 2 hours after taking DMG. This is another one that I have read mainly helps with speech and mood/behavior. Cons for DMG: This very occassionally can cause hyperactivity, but it’s not very common. 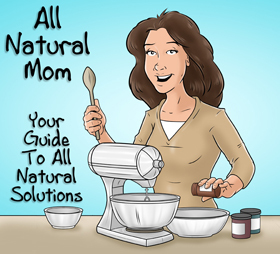 Most moms report no negative side effects for DMG, though it may increase yeast. Brand We Use: Serotonin Support Powder by Quantum Elementals, or 5HTP capsules from Solaray. Contents: 1,080 mg of L-Tyrosine and 108 mg of L-5-hydroxytrptophan (aka 5HTP). This is for 1/4 of a teaspoon. My DAN! doctor crushes up the 5HTP in higher doses so that we can put a tiny scoop (that they provide) into juice. The scoop is probably about 1/16 of a teaspoon. They end up getting about 25 mg of 5HTP per scoop. The capsules we have contain 500 mg of L-Tyrosine and 50 mg of 5HTP in one capsule. Where To Order From: We order from our DAN! doctor’s web site, www.elementalsliving.com. They charge $59 for a bottle, plus shipping. It lasted us almost a year. I give my older son the capsules from Solaray, which you can get at your local health food store. They are in 50 mg doses. How To Take: With the Serotonin powder, my daughter started out with one scoop in the morning with breakfast and one in the afternoon with dinner. We recently increased it to 2 scoops in the morning and one scoop in the afternoon because she has still been having tantrums. The usual recommended dose is 50 mg per day. You can divide this up into two 25 mg doses a day. I believe you can go higher on this if needed, but check with your doctor. Pros for 5HTP: I REALLY like this supplement. My daughter was tested (a blood test) for her serotonin levels before starting this. Her level was at 56, when it should be around 250. People with depression almost always have low levels of serotonin. My oldest son’s was at 96. Low serotonin has also been linked to ADHD. Low levels of serotonin can be hereditary which is probably why depression tends to run in families. Prior to taking 5HTP, my daughter would cry at EVERYTHING. We had to very careful about what we could allow her to watch on TV, because everything made her cry and sometimes it was hard for her to regain herself. Once she started taking the 5HTP, her mood improved GREATLY. She still gets a little sad on some movies, but she is SO much better than before. She’ll more whimper a little bit and hold back tears, instead of sobbing like she used to for up to 2 hours. After a year of being on the supplement, we tested her serotonin levels again, and they are now at 250, so we have temporarily discontinued this supplement until we talk to her DAN doctor again. This supplement is also supposed to help with sleep if someone is having trouble falling asleep or staying asleep. Lynsey has never had any problems with that, so I don’t know if that helped in that area or not. That is why it’s good to take it also at dinner time. My DAN doctor has this supplement listed as helping support focus and concentration. Cons of 5 HTP: I believe I have read that very occassionally this supplement can cause hyperactivity but most moms have reported that there are no negative side effects. Brand We Use: We are currently using the brand my DAN doctor recommended, Water Oz. We recently started the Low Oxalate Diet, and it is recommended to take calcium in the form of calcium citrate. It is better absorbed by the body and specific to the LOD diet in helping absorb oxalates. I prefer the WaterOz because it’s easy to put it into my kids’ juice or they just take it straight. Plus, it’s one less pill they have to take. It tastes like water. Supposedly, if there is a strong taste to it, that means you are not deficient in it. Where to Order From: I just ordered the Water Oz from http://www.nutritiongeeks.com/ for $44 for a gallon, $14 for 16 oz and $22 for 32 oz. How To Take: Our DAN recommended taking once in the a.m. and once in the p.m., or at breakfast and dinner. With meals is best but a snack is OK too. On the Low Oxalate Diet, it’s recommended to take at every meal as it binds to oxalates in foods. If taken away from food, it will be absorbed by the body more, but you don’t need to take it away from food. Take with magnesium (usually a less amount of mag – like a 2:1 ratio), and at least 2 hours away from zinc. The zinc will not allow the cal/mag to be absorbed as well if all 3 are taken at the same time. Based on my daughter’s tests, she is taking 3 teaspoons of Calcium Water Oz twice a day. If you order capsules, you want about 1,000 mg of calcium a day and 500 mg of magnesium. Compliments: Should be taken with Magnesium to get maximum benefits. Calcium can cause constipation, and magnesium can cause diarrhea, so taken together, they balance themselves out and are better utilized by the body if taken together. Pros for Calcium: If you’ve seen any milk commercials, you know the benefits of calcium. I’ve read that one of the biggest mistakes when someone starts the GFCF diet, is not supplementing with calcium and magnesium. Magnesium is just as important as calcium, but isn’t marketed as much as calcium. Calcium is important for strong muscles and bones and helps prevent osteoperosis. You’re most at risk for developing osteoperosis when you get older, based upon the amount or lack of calcium you get as a teenager or younger. I was surprised to read that. So for women especially it’s an important supplement at any age. The receptionist at my DAN doctor’s office said she feels 100% better after she takes her cal/mag supplement, in terms of energy especially. I’ve also read that a deficiency in calcium and magnesium can cause depression, and severe deficiency in calcium can cause kids to rub their eyes like they’re in pain. Most kids are deficient in cal/mag, so it’s a good one for everyone to supplement. Cons of Calcium: Calcium can cause constipation, especially in high amounts, which is why it’s recommened to take along with magnesium. If you notice this happening, you can add Vitamin C (about 500 mg) to help with constipation, increase magnesium, or push more fluids and vegetables. You can also give your child a bath with Epsom Salt. Epsom Salt has natural occuring magnesium in it. As your child soaks, they will absorb the magnesium. Brand We Use: We are currently using the brand my DAN doctor recommended, Water Oz. You can also get Pure Encapsulation brand Magnesium Citrate or Magnesium Malate. Where to Order From: See notes under Calcium. I ordered from http://www.nutritiongeeks.com/. How To Take: Our DAN recommended taking once in the a.m. and once in the p.m., or at breakfast and dinner. With meals is best but a snack is OK too. Take with calcium and at least 2 hours away from zinc. The zinc will not allow the cal/mag to be absorbed as well if all 3 are taken at the same time. Based on my daughter’s tests, she is taking 2 teaspoons of Magnesium Water Oz twice a day. Compliments: Should be taken with Calcium to get maximum benefits. Calcium can cause constipation, and magnesium can cause diarrhea, so taken together, they balance themselves out and are better absorbed by the body if taken together. You can get magnesium from Epsom Salt baths as well. I give both oral magnesium supplements and Epsom Salt baths, as do many people without a problem. Magnesium allows B vitamins to be absorbed better, especially B-6. So, if you are taking B-6, take it at the same time as magnesium. Pros for Magnesium: Magnesium is just as important as calcium but doesn’t get as much press as calcium. My DAN doctor lists magnesium as helping to relax nerves, relieve tension, and also helps with constipation. Deficiencies in magnesium can cause problems like depression, headaches, stunted growth, and other things. Cons of Magnesium: Too much magnesium can cause diarrhea. Brand We Use: We are currently using WaterOz. I also have some Zinc 30 by Pure Encapsulation and Zinc Picolinate by Thorne. How To Take: I have read that the recommended dose of zinc is about 20 mg, but my DAN doctor had recommended 30 mg. Take with food, usually at night. If taken on a empty stomach, it can cause nausea. Zinc usually has a calming effect, which is why it is recommended to take at night. For some kids, zinc can cause hyperactivity (although I have read for other supplements like epsom salt baths, if your child is extremely deficient in something, when you first start taking it, it can cause hyperactivity while the body adjusts). For this reason, it is recommended to give it the first time in the morning to watch for this. If it doesn’t cause a problem, give at night. Give at least 2 hours away from calcium and magnesium, as it can cause disruption is how the cal/mag are absorbed. This is the hardest part of giving zinc. I used to give it with dinner but on the low oxalate diet, you’re supposed to give cal/mag with dinner. So, I would say give zinc with dinner, and cal/mag either 2 hours after dinner or right after school. If you can’t do exactly 2 hours, that’s OK. I’ve seen many supplements that group cal/mag/zinc all together in one pill. Based on my daughter’s tests, she is taking 3 teaspoons of Zinc Water Oz twice a day. Pros for Zinc: Zinc helps support the immune system and helps with detox support. It also has a calming effect so it’s good for ADHD kids. I took my kids to a wholistic doctor when they were little, and she looked at my kids’ nailbeds and said they were deficient in zinc. Apparently, you are supposed to have that round white half moon shape at the bottom of your nails. If you don’t, it means you are deficient in zinc. (I don’t have any! :0) She put my kids on a zinc supplement, and they weren’t sick for 6 months. It’s a GREAT immune booster. I’ve also read that if kids are chewing on shirt collars, clothes, licking things, etc., it can mean they are deficient in zinc (the other possibility is yeast overgrowth). Zinc has some kind of significant association with copper, but I haven’t needed to look into that yet. I believe it is that if you have too much zinc in your system, it can deplete your copper levels. I’ve also read that if your kids cannot tolerate chocolate (my son gets very aggressive), it can mean they are deficient in zinc. If you have an extremely picky eater – doesn’t have much of an appetite, this is a sign of zinc deficiency. Zinc tends to cause an increase in appetite, especially for those with a zinc deficiency. I’ve read that many men with prostate cancer have zinc deficiencies. Cons for Zinc: Zinc can cause naseau if not taken with food. Otherwise, it’s a great supplement that almost everyone needs. Vitamin D, and specifically D3, is vitally important, especially for the immune system. If you read on http://www.mercola.com/ at all, Dr. Mercola raves about vitamin D3 all the time. He believes vitamin D3 deficiency is one of the main causes of autism (in the mother mainly). I have read this from other sources as well. There was a study done of a group of refugees from Somalia I believe it was that came to America and were brought to live in Minnesota. Where they came from, it was very warm year round, and the people were outside most of the day. Going to Minnesota, they got much less sunlight and therefore less vitamin D intake. Many of the children born to the mothers that became pregnant after coming to America developed autism. The rate of autism back in their country was almost zero. They believe this increase of autism was due to two things: vitamin D deficiency, and another biggie – the pregnant women and their newborn babies were now being vaccinated. If you are pregnant, make sure you are supplementing with vitamin D.
Mercola believes everyone needs high doses of vitamin D to maintain healthy immune systems. Vitamin D is produced by the body from the sun, but most of us will not get near what we need from the sun alone, even if you live in a warm climate. If you live in the midwest like I do and it’s cold in the winter, you need a higher amount in the winter. The recommended amounts vary but we take 2,000-3,000 a day. Some people do as high as 20,000. Vitamin D deficiency can cause depression, which is why so many people are more depressed (and sick) in the winter because they are not getting as much sunlight, and therefore not getting as much vitamin D.
I’ve heard one person say they take vitamin D to help with the pain of headaches. Never tried that so don’t know if it works. Brands We Use: I have some Carlson brand right now that is 2,000 mg. I also have some Pure Encapsulation brand that is 1,000 mg.
How to Take: Take away from vitamin C as it will inhibit absorption. If taken with magnesium and calcium, it will help you absorb cal and mag better, but if you want to absorb the vitamin D better, take it away from those. I have a Solaray cal/mag supplement that has 400 mg of vitamin D added to it, then I take the 2,000 mg of vitamin D at a different time of day. Cod liver oil is also great for the immune system, but it’s also good for the brain and brain development. It often helps kids with ADHD symptoms. It’s great to take while pregnant (take a clean supplement like Green Pasture to avoid mercury). It will help the baby’s developing brain, and I’ve also read it can help prevent future allergies in the unborn child. Woo hoo! All for that. Brands We Use: I usually order from http://www.greenpasture.org/, the Fermented Cod Liver Oil in gelcaps. It is free of soy. There is only one other company that I know of that makes CLO without soy and that is Kirkman’s (order online). I’ve also used theirs but Green Pasture is a very high quality CLO. At local health food stores, you’ll find liquid CLO. It has a strong taste (and soy), so we prefer the gelcaps. Also, you have to be careful with CLO because some brands will be tainted with mercury from the fish they use. Nordic Naturals also makes some fish oils that are pretty good and they make gelcaps which the kids tend to like. There are lemon and strawberry flavors. You can call Nordic Naturals and get free samples mailed to you. They do contain soy though. How To Take: Take with food. If taken without food, sometimes you will belch and it will taste like fish oil. Yuck. I give it to my daughter before school to help her concentrate better but you can probably take it at any time and I don’t know of any supplements that it should not be taken with. Brands We Use: Currently, we are using Klaire’s Detox Support, which is a 50 billion (very high dose). You can only order it by calling their 800 #. Tell them you heard of them through Dr. McCandless’s book and you will receive a 20% discount every time you order. You don’t want to start with this though. I also have Floragen 3 which I got from our local health food store in the refrigerated section. This one is a 15 billion. I take this one and my 3 year old takes half of one capsule. When you start with probiotics, start slow and work up – like around 2-3 billion or so and increase every few days till you get to one capsule a day. You don’t want to experience yeast die off effects (like headache, upset stomach, etc.) by going too fast. I don’t recommend ThreeLac as Jenny McCarthy does in her books. It contains a strep strain which can cause some kids to get strep throat. My son did. The body mistakes it for the real strep virus and it will develop strep antibodies to try to fight it off, and they will get strep throat. This doesn’t happen with all kids, but it does happen to some. The same is true of some yogurts like So Delicious Coconut yogurts. Nearly 100% of all autistic kids have yeast overgrowth, so probiotics are the base supplement that they are going to need every day. But, it’s necessary for everyone. ASD kids just need a higher amount to help fight off the massive yeast overgrowth they have. If you are pregnant, probiotics are also a must, especially nearing birth. The baby picks up your bacteria in the birth canal to start off their own in their own bodies. If you have a lot of yeast, they are going to take this with them. You want to make sure they are getting some good bacteria too. Many women also suffer from yeast infections while pregnant. Probiotics will help with this, but it isn’t a quick fix. It will take about 10 days or so to help, but there are many other things you can do to help with that. I have lots of experience with that. E-mail me. Also, if you do get yeast infections while pregnant, that means you have a lot of yeast overgrowth, and you don’t want to pass that on to your baby, so get it under control now. I believe that is one of the contributing factors to autism as well – babies born to mothers who had yeast overgrowth and passed it on. How to Take: Taking at night before bed is best. You want to take it about 2 hours away from food and supplements, on an empty stomach. If taken with a snack, that’s OK. You can take it with food, but then it will go to work helping to digest the food instead of working on yeast. Some people take with food for that reason, but if you are taking it to help fight yeast and repopulate the gut with the good bacteria, try to take on an empty stomach as much as possible. You can also take in the morning before breakfast (at least a half an hour before). If you are on antibiotics, double the amount of your probiotics while you are taking the antibiotics. We take one in the morning, and one at night. The antibiotics are going to kill off all bacteria, including the good ones, so you want to repopluate them. This is why so many people develop a yeast overgrowth in the first place is because all the good bacteria have been irradicated, and now the yeast and bad bacteria thrive having no good bacteria to fight them off. 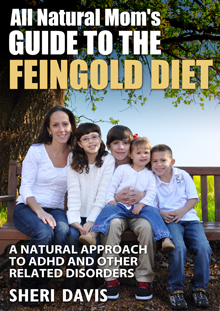 “All Natural Mom’s Guide to the Feingold Diet – A Natural Approach to ADHD and Other Related Disorders”e-book available now on Amazon! Posted in Biomed and tagged All About Supplements. GREAT post!! Great supplement info. What is a DAN doctor? DAN! doctor stands for Defeat Autism Now! There is a certain protocol that doctors who call themselves DAN's generally follow. They've seen what typically works for other kids with autism, although no two kids are entirely alike. They are similar to holistic doctors but have a focus on autism and the like. Can your child swallow pills? There are a few that are good but if he can't, Freeda (online) makes a chewable unflavored vitalet that is FG stage 1. My kids used to like them, but now they don't. Call them and see if they'll send you a free sample to try them out. They're big chewable tablets. Like the size of a nickel. If he can do stage 2 and needs a chewable, there are a few gummy options. Most at your health food store and Trader Joe's will be OK. I don't think they contain enough of the vitamins to be worth the money so I don't buy those even for my youngest who can do stage 2. But, it's something. We use the Water Oz for zinc, cal, and mag and I use Carlson vitamin D drops b/c those are all flavorless, stage 1, and can easily be added to juice. My kids started swallowing pills around 4-5. Or, you can also buy the capsules and open and dump them into juice or smoothies. I've done that too but the multivit's tend to have a taste to them so I can only get 1/2 capsule or so in without them noticing. We use Pure Encapsulation brand children's multi or Thorne Research Children's Basic Nutrients. Both are good but require several capsules for a day's dose which is the only drawback. Hi Sheri – do any of your children take a digestive enzyme? Yes, lots! I need to add to this list soon. We use Enzymedica Digest Gold for general use. My daughter has issues digesting fruits and veggies so she takes Allerase with those. I take Lypo Gold (for gallbladder) and my daughter does sometimes too with high fat meals like meats or anything greasy. My older son takes Houston Enzymes AFP or Trienza with gluten and dairy. We use the AFP chewables if my younger kids ever eat out. We used to use their No Fenol but my kids don't like the taste anymore and won't take them. 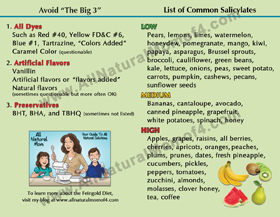 No Fenol is for high salycilate foods or some people will take it if their child has an infraction on the Feingold Diet with dyes or something else. We just started using Biofilm Defense Enzymes from Kirkman. It helps digest food if taken with food. Without food, it helps break down biofilm, so that yeast and bacteria can be eliminated more easily. Enzymes are great for improving bathroom habits and aiding in the digestion of foods so that the body can utilize all of the nutrients from the food. How old is she? My daughter started swallowing pills at 4 1/2. Have you tried the individual chewables – AFP, Zyme Prime, and No Fenol? They can send you free samples. That might work better but is more expensive. My kids don't like the new Trienza chewables either and then they changed the formula on the other chewables too and they don't like them. The only ones they'll take are the AFP, reluctantly. We haven't tried the new Zyme Prime chewables. She is 3.5 (turns 4 in February). Diagnosed with autism spectrum disorder in April 2011. She does a lot of therapies – ABA 5 days a week for 5 hrs each day, speech therapy twice a week, occupational therapy twice a week, physical therapy once a week and hippotherapy once a week. We are blessed that she loves to be hugged and kissed, she is verbal and can get her needs met (no conversational speech yet), and is potty training well, but she does stimming, scripts and has trouble listening/focusing and eye contact is still not what we would like it to be. Been on GFCF for about a 1.5 months so far. We just started down the DAN! doctor route a month ago, but now our doc is leaving to go to a different practice in CA, so we need to find a new one. We live in IL too. Any suggestions? Our little one is on SPEAK fish oil (2 capsules w/breakfast), magnesium 2x/day (breakfast/dinner), adrenal support drops, TriEnza 2x/day (breakfast/dinner) and two types of probiotics from Kirkman after dinner. We recently got back the first round of blood/urine tests ordered by our DAN! and now need to get with a new DAN! to see what to do next. Yeah, prob too young to swallow pills yet. I'm in Northern IL and see Dr. John Hicks. I like him. We do Skype with him. He makes some vibrational remedies that are liquid drops that taste like water. I was turned off by them at first, but I think they're fine. The Detox Boost will have B-12 in it, DMG, and a few other things. It's nice for little ones. He custom makes them to fit their needs. Does your insurance cover ABA? We've never done ABA but I'm thinking about it. How in the world do you fit that in? Do you feel it's beneficial? I have 4 kids so I'm not sure how I'd manage with getting her there and everything but if it was helpful, it might be worth it. We've done hippotherapy. Loved it! We went to Blazing Prairie Stars in Maple Park. I feel like she really needs to learn more appropriate social skills. I'm also going to call Dr. Usman's office today. She does a biofilm protocol that I'm interested in learning more about if Dr. Hicks doesn't do that. We are in Northern IL too – a suburb between Chicago and Rockford. We saw Dr. Chandra at True Health Medical (Dr. Usman's office). Thank you for the suggestion of Dr. Hicks – I will look into him. Are you familiar at all with Dr. Brown at ARCH Medical Center in WI? Our insurance is through BCBS-IL and our plan does cover ABA therapy. We do it through a preschool environment and it has been very effective for our daughter. Can you believe that I work full-time too? It's craziness! And we have a 9.5 month old too. Some days I think I will be the one needing therapy. From the information I have read, early and intense intervention is critical for children with autism, so we jumped at it in full force. Now we are adding in the biomed route to make sure our daughter's body is the best that it can be which should help make all the therapies even more effective. It sounds like your daughter is high-functioning? Is Dr. Usman's whole practice relocating? You'll have to e-mail me. We live in the same area. Wondering where you do ABA through. We've been to Dr. Brown. I like Dr. Hicks better. I've gotten the same feedback from other people too. Dr. Brown can seem like he is just doing all the typical things that DAN dr's do without tailoring it to the individual. I felt like I knew more about what to do with my dd than he did. Someone put it – they felt like he was just throwing darts. I went to him b/c I wanted to get a second opinion and see if he would try anything different than Hicks. We went back to Hicks. Yes, she is high functioning, and yes it is crazy! Biomed is only for the warrior mamas.